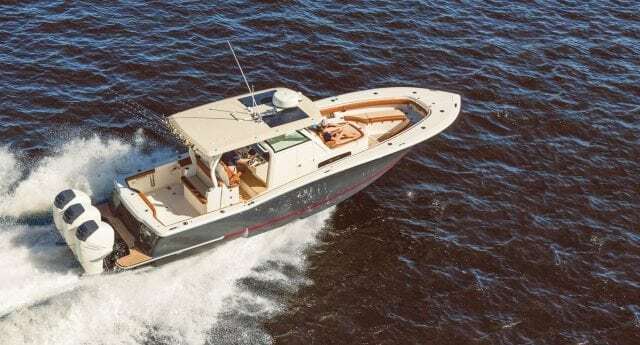 Scout Boats introduces two new models 355 LXF and 235 XSF. 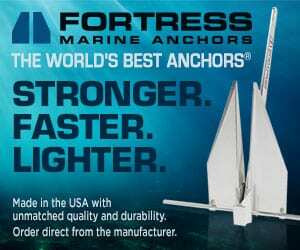 The Miami Boat Shows mark the debut of the 355 LXF (34’11” LOA, 10’9″ beam) and the 235 XSF (23’8″ LOA, 8’6″ beam). 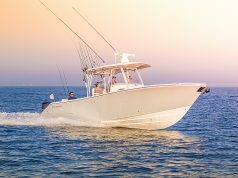 The 355 LXF is built on Scout’s epoxy-infused, double-stepped, fuel-efficient hull. 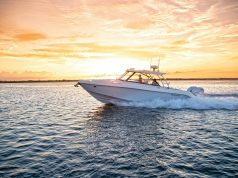 With triple Yamaha 300-hp outboard engines, the cruising speed is in the mid-30 mph range, while the top speed is in the mid 60-mph range. 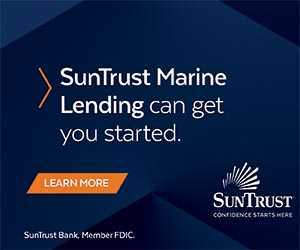 Built to accommodate a Seakeeper 3DC gyro stabilizer, the model also showcases optional hardtop-mounted solar panels that provide a trickle charge to the batteries. 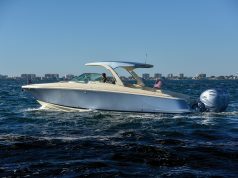 The 235 XSF runs to a top speed in the mid 50-mph range and a cruising speed in the low 30-mph range when powered by a 250-hp outboard engine. One notable feature is that Scout did away with the splash well at the transom by extending the outboard shaft allowing for a level platform across the entire swim platform. The model offers a standard powder-coated T-top hardtop with LED spreader lights fore and aft, and a fully integrated windshield.